It’s one of the great ironies in my life, that I’m so passionate about skincare products, but I can’t try many as my skin reacts quickly and violently to products that aren’t right for me Okay, so violently may be something of an exaggeration but if I’m not using the right products for me then my skin either dries out horribly or breaks out horribly and if I’m especially unlucky then its a combination of both. One brand I can always trust is Aromatherapy Associates. And I’ve been trying out the Aromatherapy Associates Instant Skin Soothing Serum* for a couple of months now and it’s time to report back. I’ve been using the Soothing Face Oil for a long time now and I love it, it moisturises but doesn’t break me out so I was keen to give this a whirl too. Actually, if memory serves me well I have tried this product before, but it must have been a long time ago. I’ve said before that I’ve never had a dud Aromatherapy Associates product and that still holds true, I’m aware that I sound over-enthusiastic sometimes but the products really are this good and the Instant Skin Soothing Serum is no different. The serum contains prebiotics to maintain the skins barrier, Cotton Thistle Extract to support the natural process of skin renewal, while arnica and camomile soothe irritated skin. As with all Aromatherapy Associates products, it smells gorgeous, but what I love best of all is how well it works on my skin, whatever its condition. If I’m a bit dry, this hydrates, if I’m spotty this soothes and cools redness, helping to reduce swelling, its just a great addition to anyone’s skincare routine, whatever your issues might be. The texture is light and traditional (in terms of serums) and skins in fast meaning you can just go ahead and apply your make up on top, but I tend to go use this under my moisturiser. As with all Aromatherapy Associates products I find the price is higher than I think I’d like but when you try the products out, its easy to see they are extremely high quality. This is a truly effective range of products, and if they suit your budget I would absolutely encourage you to try them out. The Aromatherapy Associates Instant Skin Soothing Serum is £47.00 for 50ml and you can purchase it from the Aromatherapy Associates Website. Today I’m doing a post about a beautiful product, the Aromatherapy Associates Anti-Ageing Overnight Repair Mask*. I’m afraid this is something of a luxury product at £59 for 50ml, but it’s incredibly effective and an ideal product for skin requiring some tlc. It’s easy to use, you simply apply to the skin in the same way as any face mask and leave, overnight for best results but if you are strapped for time at least two hours will do. Ingredients include rose, frankincense as well as other potent botanical extracts. Strawberry seed extract feeds your skin rich fatty acids, while rice germ and millet seed oils nourish and protect against environmental damage. As you might expect the smell is beautiful, everything Aromatherapy Associates make smells beautiful, but the effects on the skin are clear. I find when I wake up in the morning, my skin feels refreshed, healthy and glowy. Makes a very pleasant change to waking up dull, grey and tired looking. Although suitable for all skin types, I think this really excels with dry skins, its made a big difference to my dry patches. I can highly recommend this product however, I am not thrilled about the price. I have loved every single Aromatherapy Associates product I have ever tried, and I have tried many, but the price point is high. I don’t doubt the quality at all, it is exceptional, but £59 for this small 50ml tube is far too excessive for me, this is a product I would like to use regularly, as the benefits for me are great, but I really couldn’t afford to. I think you could take £20 off the price and it’d still be an expensive product. Oh but it is beautiful, it truly is, and it really has a great effect on my skin, so yes, I do recommend it, but I would recommend searching around, various retailers stock this product, at slightly cheaper prices. But Beauty Bay are currently selling it for £42.40, which is a saving not to be sniffed at. I’m a huge fan of Aromatherapy Associates products, my favourite of them all is the Soothing Cleansing Balm which is perfection when it comes to removing make up and leaving skin clean and soft. Today I’m reviewing the Inner Strength Body Oil*. A couple of weeks ago my GP declared me officially exhausted. If I had a job, I’d have been signed off sick, but I don’t have a job and I’ve not been signed off, alas it has mean less blog posts than I would have liked, anyway, my point is my stress and lack of sleep have meant a product with “Inner Strength” in it’s name couldn’t have come at a better time. Rose, Clary Sage, Frankincense, and cardamom essential oils sooth and inspire positivity while jojoba and peach kernel oils moisturise deeply. I’m a firm believer in aromatherapy, its just basic, some smells make us feel good, a big sniff of lavender can cure a headache for me sometimes and so it is that Inner Strength does make me feel positive. Of course, it could just be the pleasure of using such a beautifully scented product that makes me feel happy, but who knows! This is a truly luxurious product, a real treat to use that feels beautiful on the skin and leaves a gorgeous scent. Its a bit pricey at £41, but the ingredients and packaging are exceptional, as are the results. 10% of all proceeds from this product are donated to Defence Against Cancer. 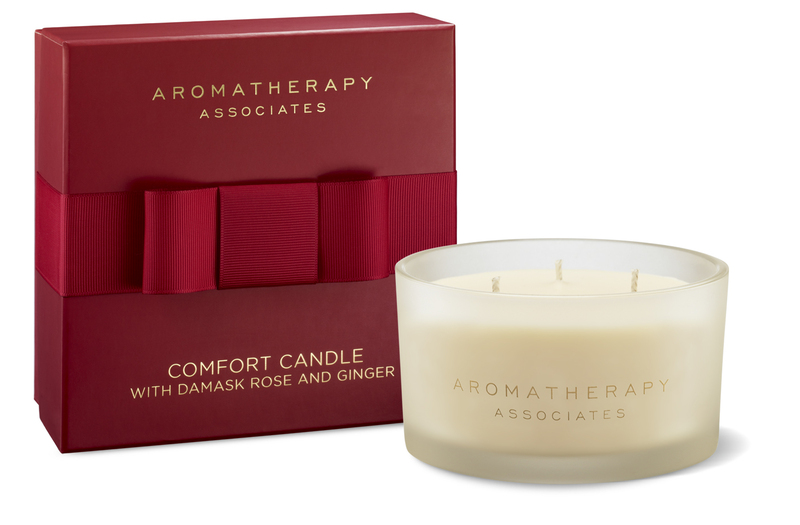 Available from Aromatherapy Associates Online. Today I’ve got a beautiful new product to tell you about. As regular readers will know, my skin is a constant battleground, with blocked pores being standard along with a monthly hormonal break out that lasts most of the month. I’m using a pretty successful routine at the moment and am very careful which skincare samples I accept these days, looking only for those that won’t worsen the spots and help clear the blocked pores. So I was pretty keen to try out the latest skin care product from Aromatherapy Associates. The Polishing Essential Enzyme Peel. So what we have is a product that gently exfoliates without any harsh abrasives to aggravate. It contains Pineapple, Passion Flower and Grape fruit acids to break down dead skin cells along with Carrot Oil which is rich in Vitamin E and anti-oxidants. All you need to do is apply a later to your face, leave on for 5-10 minutes before removing with a warm, damp cloth. Follow up with toner, treatments and moisturiser. Depending on the state of your skin you can use this once or twice a week. It tingles a little when you use it, just to warn you, but it’s not painful or uncomfortable and unlike some peels it won’t leave you with a red face. It smells lovely and is a pleasure to use, personally I really enjoy the tingle. The end results are cumulative, each time I use it I feel my skin looks a bit better and feels a bit softer. That’s absolutely not to suggest though, that after one use you won’t see any results, you will. Or at least I did. My skin was softly glowing and felt so soft. I feel that although the difference isn’t massively obvious with each use, I can see things improving, those little bumps on my skin are getting fewer and my skin really does feel so much softer. You can pick up your product here and if you’re really in the mood for shopping then Aromatherapy Associates have now released all their Christmas Gifts which are always lovely, and I’d have to recommend treating yourself to the Festive Bath & Shower Collection! I recently received the Renewing Rose Cleanser to try out. I love the AA Rose Renew body products I’ve tried in the past so was keen to try this one out too. First up, the beautifully simple Aromatherapy Associates packaging, it’s a pump bottle which is something I do like in a cleanser as it’s much easier to manage with wet hands etc. The product itself is a cream consistency, or a lotion, you apply over your face and neck and then rinse off with warm water. Ingredients wise, there’s Damask rose water, geranium oil (which helps balance the skin’s natural oils and jojoba. I started off using this with my Clarisonic, it smells divine and it certainly left my skin clean, but I decided it wasn’t quite right for use with the Clarisonic but I didn’t want to stop using it so now I use this to cleanse my face first and remove my make up before using another cleanser with my Clarisonic afterwards. Using this alone (and without following up with the Clarisonic) this leaves my skin soft, clean feeling and lightly rose-scented. I’ve also noticed that my skin seems quite happy with this new regime so I can’t see me dropping this one any time soon. It’s also, unusually for Aromatherapy Associates, not too costly, at £22 for 200ml this isn’t outrageously priced, although obviously more than your average Boots/Superdrug cleansers. I must admit, that I’m still really on the hunt for a whole range that will suit my skin, including something to use with my Clarisonic, but I think this cleanser makes a great foundation for me to start with. Aromatherapy Associates never fail to impress really. The Renew Rose Massage & Body Oil in an award-winning oil and on first use its not hard to see why. It’s a light oil, made with Evening Primrose Oil, Neroli oil and Rose oil. I have been using mine as a moisturiser but when using it’s easy to see why this is also recommended as a massage oil. Alone this moisturises really well but for an extra luxurious moisturising treat it works exceptionally well over the Rose Renew Hydrating Gel. Where the Gel is lightly scented the oil is a more heady scent, which I suppose also adds to its usefulness in massage, and in this case the Neroli is evident and as it’s one of my favourite scents this oil is perfection. It leaves my skin feeling amazing. It’s perfect for protecting again stretch marks in pregnancy, is highly recommended for those whose skin is exposed to the elements and for dry skin. I’m none of the above but I’m finding in this Winter weather this is really helping and it’s such a pleasure to use. It’s like a ritual for me now, stepping out of the shower, using the Hydrating Gel and then following with the Oil. Also am thinking this is a good one for Valentines? It’s a real treat and certainly would help to set the mood, wink wink. 100ml in a beautiful glass bottle is £36 and available from the Aromatherapy Associates Boutique & Treatment Rooms, and www.aromatherapyassociates.com. Looking for lovely smelly Christmas gifts for the important people in your life? Well look no further than Aromatherapy Associates this year with the usual array of gorgeous products with something for most budgets. My top pick HAS to be the Little Star (£10.00). 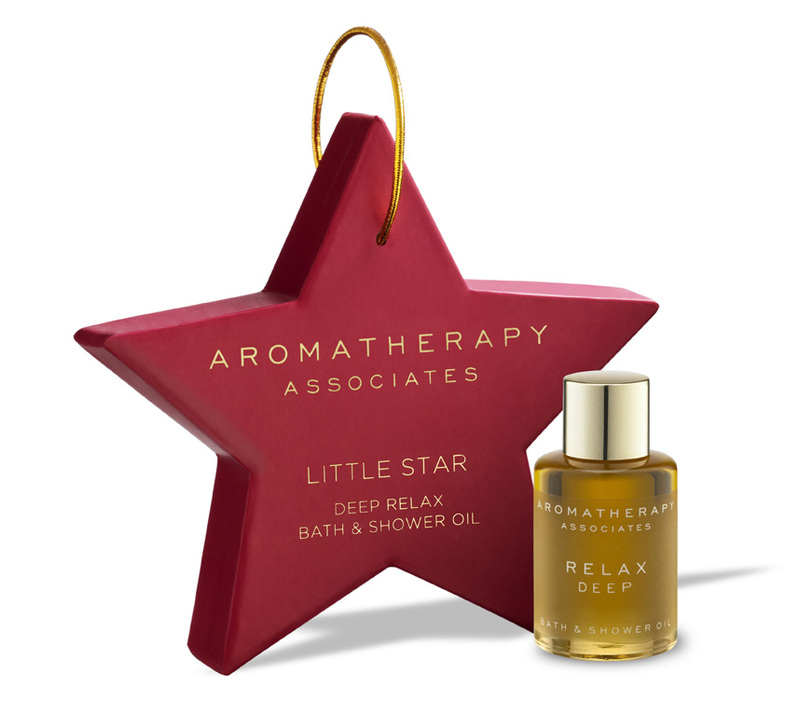 A star shaped tree decoration housing a little 7.5ml bottle of the best oil ever, Deep Relax Bath and Shower Oil. If you don’t already know how much I adore this stuff then read all about it here! Not only a great little treat for someone special but if you’re doubtful about spending £37 on the full size bottle then it’s a great way of trying it out, it’ll last for ages if you use it like I do, on your pulse points at bedtime. But then for £5 more you can get two bottles in a lovely red box (but not a tree decoration). Two 7.5ml bottles, one each of Revive Morning and Deep Relax. Depends whether you want the star shaped box or not, this gift is definitely better value. Taking a big price leap up, there’s the three wick Comfort Candle (£45), 42 hours burn time. I have the smaller £24 version of this which I keep on my bedside table and it’s nearly dead… this would be a great replacement! Damask Rose and Ginger and it’s gorgeous. But if that’s out of your budget (and it’s definitely out of mine) then there’s a little set with two small candles in Relax (myrrh and West Indian bay) and Revive (pink grapefruit and petitgrain). I might put that on my Christmas wish list. It’s a larger version of the Miniature Bath & Shower Oil Collection which is gorgeous. Alas, I won’t be getting one of these but if anyone I know is feeling flush and doesn’t know what to get me for Christmas then…. All gifts are available from the Aromatherapy Associates Boutique and Treatment Rooms in London, Liberty, Space NK, Fortnum & Mason and of course www.aromatherapyassociates.com. Another lovely product from Aromatherapy Associates. It is almost as though they are a brand who can do no wrong when it comes to products. I’ve not yet had a dud. The Renew Rose Hydrating Body Gel is as the name would suggest, a body moisturiser in a gel form. It’s made with damask rose water, geranium and evening primrose oil and is lightly perfumed. It’s a lovely scent but it is light, I’d like it to be a little stronger, but that’s a question of taste and I’m well known for loving strong strong scents. I really love the smell, so much I’d like it to linger longer! I must say that after using this both my daughter and my husband commented on how nice I smelled. Perfect for someone who likes a light floral scent that isn’t overpowering and doesn’t need a heavy duty moisturiser for their body. At the moment I’m all about the Enrich Body Butter which I love. The Renew Rose Hydrating Body Gel is available from www.aromatherapyassociates.com and costs £27.50 for 200ml so is definitely a luxury product. Wild Camomile, Petitgrain, Frankincense, Rosemary and Coconut oil all blend together to sooth, refresh and clarify your thoughts and minds. The smell is beautiful. Does it work? Yes, it really does. It doesn’t stop my kids whining, or pack my holiday suitcase for me but it certainly calms me down enough to cope with those things without getting stressed out quite so much. My only problem with this is that of course you can’t just have a bath every time you get stressed, so I do again, like to use these on my pulse points, but it’s not portable and so I’d love to see all of these oils in mini roll on versions specifically for pulse points, especially in the case of the De-Stress Mind. Of course, when you’ve had a stressful day then you can’t beat slipping into a bath with a capful of this lovely stuff, I’d just love a more handy version!